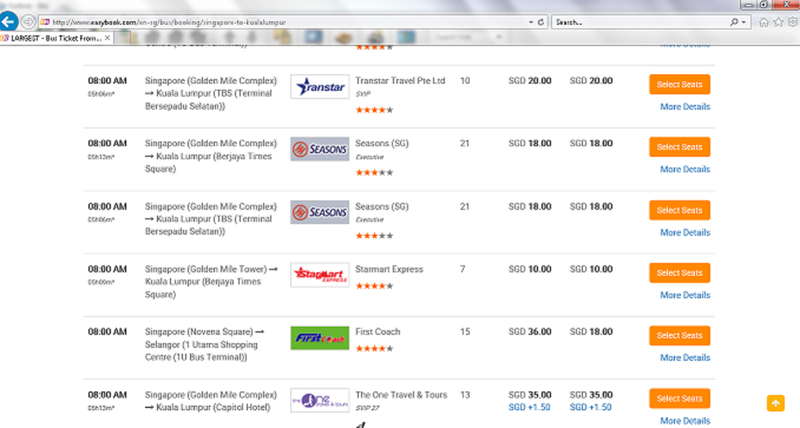 The cheapest way, short of walking or hitching a ride, to get between Singapore and Kuala Lumpur is by coach. Several companies ply this route so choosing which one to use is based largely on how convenient the departure and arrival points are to where you are, and where you want to go. I used to use a company that departs from a shopping mall 10 minutes on foot from my office. My last trip with my usual bus company ended up taking 8 hours instead of 5. I did get to see a part of Singapore that I had never seen before and I took some photos while waiting for another bus to arrive so that the passengers could be consolidated. This is a smart move, business-wise, for the bus company but it made my normal trip intolerably long. Unlike long flights on airplanes, there are no meals served, no movies to watch, and no toilets. That is why I changed bus companies. It is not as convenient for me to get to the new departure point (I have to take my luggage on the public transit) but at least once I am on the coach it is only 5 hours travelling time to Kuala Lumpur and a meal of nasi lemak and hot coffee were served on board. Please note – there are sometimes long delays at the border crossings which are beyond the control of the bus companies. If you, or friends of yours, are planning on visiting South East Asia (and I highly recommend it) please be aware that there is no duty-free allowance for tobacco or alcohol if you are coming into Singapore from Malaysia. That means ‘zero’, ‘nada’, ‘niente’, ‘none’! A few days ago our bus was delayed because some young backpackers were trying to bring alcohol into Singapore from Malaysia. We ended up leaving them at the border crossing in the middle of the night. I was reminded of an incident a few months ago when our bus was delayed because a middle-aged woman thought the open package of cigarettes she was carrying did not apply to the NO duty-free allowance law. I have travelled with Singaporean friends who threw away their cigarettes before going through immigration. Trash receptacles are provided. Although most countries allow for some tobacco products to be imported without duty, Singapore does not. Some alcohol can be imported without duty but NOT from Malaysia. It doesn’t matter where you purchased the alcohol if your last port of departure was Malaysia. I met Mervin when we were both contributors to a book called Turning Ideas into Profit. At the book launch the authors stood at the front of an auditorium and each talked about their own chapter – except for me. I would rather swim with sharks than stand in front of a group of people and speak. So I was the timer. It was my job to let each speaker know when their time was up. It is a much harder job than you might imagine. If the speaker was in the middle of making a good point, I was loathe to ring the bell. When Mervin got up to speak about his chapter “Beyond Handshakes”, he said that he was an introvert, I laughed out loud. I thought he was making a joke! How could an introvert be on stage? Clearly, I misunderstood what it means to be an introvert. When Mervin asked me to come and speak to you, a group of introverts, I thought I had better find out exactly what an introvert really is. While researching, I read that, “Mistaking introversion for shyness is a common error. Introverts prefer solitary to social activities, but do not necessarily fear social encounters like shy people do.” The word fear resonated with me. I live with fear – it is my constant companion. 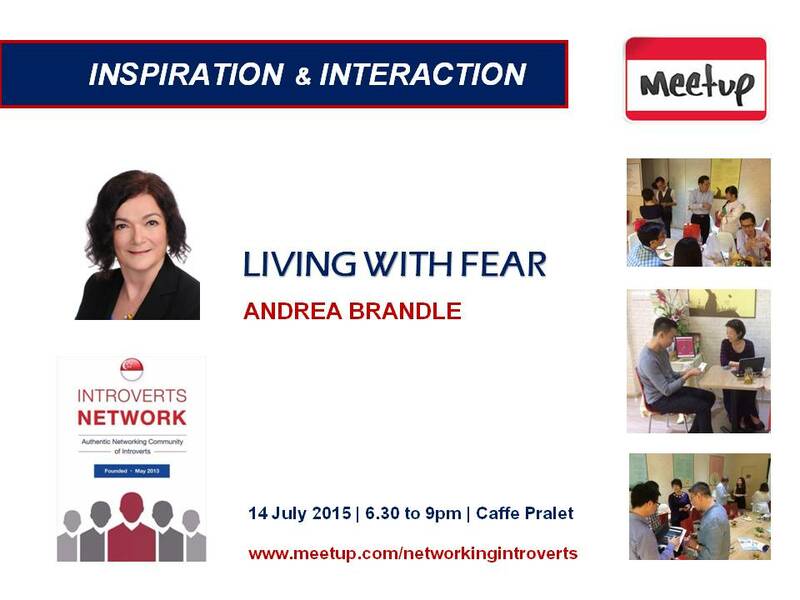 I called this talk “Living with Fear” not “Living in Fear”. The difference may seem small but it is frighteningly huge – Godzilla huge! If you live in fear you are anticipating some event that might happen such as in Japan I lived in fear that an earthquake would strike. Living with fear means that I am constantly and consistently afraid. I am afraid of ordinary things that most people would not think of as even a little bit scary. I am afraid of stairs, and by extension, escalators which are really just moving stairs. I am afraid of everything with wheels so I don’t drive a car or ride a bicycle. I am afraid of sticky things! At one time, I was phobic about insects. I could regale you with stories of being chased screaming from my home by a moth, or being reduced to tears by a small worm in my salad, but the story you need to hear is about the cockroach in New Orleans. In preparation to move to Botswana I went on a holiday to New Orleans. My logic was that if I couldn’t spend a week by myself in an American city, I had no business going to live in Africa. I was staying alone in a small apartment in the French Quarter. It was late in the evening and I went to use the toilet. I was naked. I am telling you this because, for me and for many others, nakedness increases my sense of vulnerability. I reached out a few centimeters and gave the toilet roll a tug. As it spun around, a roach almost as big as the toilet roll appeared – black against white, millimeters from my hand. We don’t have any insects this big in Canada. It was bigger than some mice I have seen. I screamed, a blood-curdling shriek, and ran out of the bathroom with urine running down my leg. I stood in the kitchen with my heart pounding. My brain knows that a cockroach cannot hurt me. My brain knows that I am far bigger and more deadly but I was terrified! So I said to myself, “well, I guess I can’t go to Botswana after all.” Surely, insects in Africa would be large and scary. But I really, really wanted to go. So I went back into the bathroom to face my fear. It took me a while to find the roach. He was hiding inside the toilet roll. He looked at me and I swear he was terrified. I could relate – so I told him that I was going to turn off the bathroom light and leave on the bedroom light and that he should then leave as quickly as his little roach legs would allow. Believe it or not, one of my biggest fears is public speaking. Do you know that according to Wikipedia, public speaking is the number one fear in North America? The second greatest is death!! Think about that, I am less afraid of dying than I am of standing here in front of you speaking. But really, everything gets easier with practice. 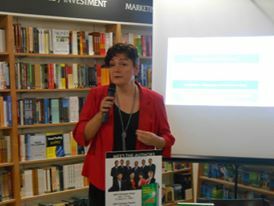 Karen Foo, who contributed the chapter on Motivating and Challenging the GenY, tricked me into speaking at a book signing event we had for Turning Ideas into Profit. It was in a bookstore and there were only two people listening but it was good practice. 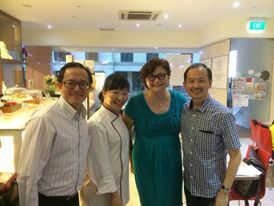 She has since roped me into being the MC at our monthly meetings for the Association of Professional Trainers of Singapore. I know she is doing it for my own good! Mervin suggested that I talk to you about travelling because the best thing about my life is that it has been lived across continents. Singapore is the fifth country I have lived in. I was born in a mining town in Canada where I spent many months of the year afraid I would freeze to death. After that I lived in Botswana in the Kalahari Desert where there are more deadly snakes than anywhere else on Earth, I have already mentioned that I lived in Japan home to earthquakes, volcanoes, and tsunami and finally Spain where I was robbed by gypsies before coming to Singapore. Many people think that means I am brave. Hardly! As a child, I read about faraway places, distant lands, exotic destinations, but I never set foot outside of North America until I was thirty years old. At thirty, the fear that I would never see the world became greater than the fear of being in a place where the people looked different from me or spoke a different language or ate different food. So it was with great fear and trepidation that I embarked upon the trip that has become my life. Sometimes people will ask me what kind of job I do that allows me to live in such diverse places. I laugh! I do a different job every where I live. Sometimes I have a job arranged before I arrive, sometimes I don’t. Sometimes I can speak the language, sometimes I can’t. I really want to earn my living as a writer but often I fear I am not good enough. I have been writing since I was a little kid but no-one has ever paid me to write. I write about my adventures and about my observations of the world around me. I write about the people I meet . I think being a writer would be the perfect job for an introvert, except for the part where you have to promote your books. Mervin can help you with that part. So why am I standing here in front of you with sweaty hands and trembling knees? Why do I pack up and move to another country as soon as I become comfortable? Perhaps I am just crazy. That would explain why an adult woman with a career and her own house in a good neighbourhood, would don a backpack, and with a one-way airplane ticket and a small tent, move to an African country she knew nothing about. Perhaps, I am not crazy but rather, I am driven by a deeper fear; maybe I am afraid of being ordinary. The point I want you to take away from this is that fear can be beaten. Fear can be overcome. Being fearful is something you should want to change about yourself. Being introverted is not something you should want to change! 25 to 30 percent of people, depending on which source you read, are introverted. Introverts are the scientists, philosophers, and artists. They are the thinkers, the ‘idea’ people. To say that introverts should try to be more extroverted is like saying red flowers should try to be yellow! Why? According to Mervin, “We know what meeting new people can possibly do for our business and careers, yet it is this exact activity that also makes us want to clam up… When we finally pluck up the courage to attend such a meeting, whether it is an obligation to someone who had invited us, or because we eventually convinced ourselves to give it a try, we develop a whole new set of fears.” The part I especially like is “Embracing your introversion is the first step to accepting yourself for who you are. Introverts have qualities that help us excel at business networking: We value quality relationships, we love discussing ideas, we enjoy one-to-one time, we cherish our alone time and we enjoy observing people.” I am not going to stand up here and read the entire book to you but I do encourage you to read it, if you have not already. It highlights the qualities introverts can bring to group meetings and helps you to understand that you absolutely, positively, do not need to be afraid of being an introvert!